Just so we are clear, before ES 2015, combining query strings with untrusted user input to create a SQL injection was done via concatenation using the plus operator. As of ES 2015, you can create far more stylish SQL injections using backticks. By itself this addition is really only remarkable for not being included in the language sooner. The backticks are weird, but it gives us some much-needed multiline string support and a very Rubyish string interpolation syntax. It’s pairing this new syntax with another language feature known as tagged templates that has a real potential to make an impact on SQL injections. // define a function to use as a "tag"
What you see above is just a function call, but it no longer works like other languages. Instead of doing the variable interpolation first and then calling the sql function with select * from widgets where id = 1;, the sql function is called with an array of strings and the variables that are supposed to be interpolated. You can see how different this is from the standard evaluation process by adding brackets to make this a standard function invocation. The string is interpolated before being passed to the sql function, entirely loosing the distinction between the variable (which we probably don’t trust) and the string (that we probably do). The result is an injected string and an empty array of variables. This loss of context is the heart of matter when it comes to SQL injection (or injection attacks generally). The moment the strings and variables are combined you have a problem on your hands. So why not just use parameterized queries or something similar? It’s generally held that good code expresses the programmers intent. I would argue that our SQL injection example code perfectly expresses the programmers intent; they want the id variable to be included in the query string. As a perfect expression of the programmers intent, this should be acknowledged as “good code”… as well as a horrendous security problem. When the clearest expression of a programmers intent is also a security problem what you have is a systemic issue which requires a systemic fix. This is why despite years of security education, developer shaming and “push left” pep-talks SQL injection stubbornly remains “the hack that will never go away”. It’s also why you find Mike Samuel from Google’s security team as the champion of the “Template Strings” proposal. The aql (Arango Query Language) function lets you write what would in any other language be an intent revealing SQL injection, safely returns an object with a query and some accompanying bindvars. Mike Samuel himself has a number of node libraries that leverage Tagged Template Literals, among them one to safely handle shell commands. It’s important to point out that Tagged Template Literals don’t entirely solve SQL injections, since there are no guarantees that any particular tag function will do “the right thing” security-wise, but the arguments the tag function receives set library authors up for success. Authors using them get to offer an intuitive developer experience rather than the clunkiness of prepared statements, even though the tag function may well be using them under the hood. The best experience is from safest thing; It’s a great example of creating a “pit of success” for people to fall into. // stuff like this instead of stuff that makes sense. // Clunky prepared statement is clunky. Injection attacks just like this one persist in-spite of the fact that a search for “sql injection tutorial” returns around 3,740,000 results on Google. They have made the top of the OWASP top 10 in 2010 and 2013 and probably will again in 2016 and likely for the foreseeable future. Motherboard even calls it “the hack that will never go away“. The standard answer to this sort of problem is input sanitization. It’s standard enough that it shows up in jokes. But when faced with such consistent failure, it’s reasonable to ask if there isn’t something systemic going on. There is a sub-field of security research known as Language Theoretic Security (Langsec) that is asking exactly that question. Dropping the students table in the comic is exactly the kind of “unexpected computation” they are talking about. To combat it, Langsec encourages programmers to consider their inputs as a language and the sum of the adhoc checks on those inputs as a parser for that language. This design and programming paradigm begins with a description of valid inputs to a program as a formal language (such as a grammar or a DFA). The purpose of such a disciplined specification is to cleanly separate the input-handling code and processing code. A LangSec-compliant design properly transforms input-handling code into a recognizer for the input language; this recognizer rejects non-conforming inputs and transforms conforming inputs to structured data (such as an object or a tree structure, ready for type or value-based pattern matching). The processing code can then access the structured data (but not the raw inputs or parsers’ temporary data artifacts) under a set of assumptions regarding the accepted inputs that are enforced by the recognizer. If all that starts sounding kind of familiar, well it did to me too. GraphQL allows you to define a formal language via it’s type system. As queries arrive, they are lexed, parsed, matched against the user defined types and formed into an Abstract Syntax Tree (AST). The contents of that AST are then made available to processing code via resolve functions. The promise of Langsec is “software free from broad and currently dominant classes of bugs and vulnerabilities related to incorrect parsing and interpretation of messages between software components”, and GraphQL seems poised to put this within reach of every developer. Turning back to the example we started with, how could we use GraphQL to protect against that SQL injection? Lets get this going in a test. GraphQL brings lots of benefits (no need for API versioning, all data in a single round trip, etc…), and while those are compelling, simply passing strings into our backend systems misses an opportunity to do something different. Let’s create a custom type that is more specific than just a “string”; an AlphabeticString. This test now passes; the SQL string is rejected during parsing before ever reaching the resolve function. There are already libraries out there that provide custom types for things like URLs, datetime’s and other things, but you will definitely want to be able to make your own. The serialize function is the easiest to understand: GraphQL responses are serialized to JSON, and if this type needs special treatment before being included in a response, this is the place to do it. In the first query, name is a string literal, so your types parseLiteral function will be called. The second query, the name is supplied as the value of a variable so parseValue is called. Your type could end up being used in either of those scenarios so it’s important to do your validation in both of those functions. The standard GraphQL types (GraphQLInt, GraphQLFloat, etc.) also implement those same functions. A query arrives, gets tokenized, the parser builds the AST, calling parseValue and parseLiteral as needed. When the AST is complete, it recurses down the AST calling resolve, using parseValue and parseLiteral again on whatever is returned before calling serialize on each to create the response. Langsec is a deep topic, with implications wider than just what is discussed here. While GraphQL is certainly not “Langsec in a box”, it not only seems to be making the design patterns that follow from Langsec’s insights a reality, it has a has a shot at making them mainstream. I’d love to see the Langsec lens turned on GraphQL and see how it can guide the evolution of the spec and the practices around it. The internet is a global network. You would think that the fact that every message sent over it passes though many legal jurisdictions would make the need for encryption obvious and uncontroversial. Sadly that is not the case. The need for something more than legal safeguards becomes obvious when you see that a request from a Toronto home to toronto.com (whose server is in Toronto!) leaving Canadian legal jurisdiction on a path through both New York and Chicago before finally reaching it’s Toronto destination. 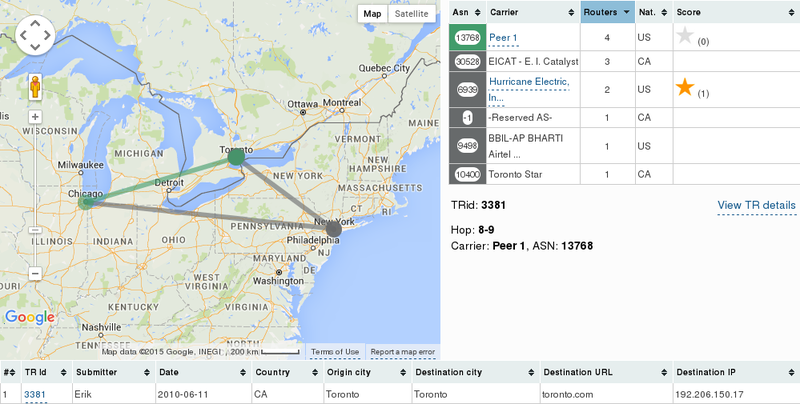 An example of a boomerang route from the ixmaps.ca project. About 25% of traffic with both a start and end point in Canada is routed this way. Applications that deliver technical safeguards, like end-to-end encryption, offer that “something more” that protects my data beyond the border. One of these a applications is Signal, a project of Open Whisper Systems. In an offline world, privacy was the default, a product of things you didn’t say or do, and probably also a byproduct of how hard it was to move information around. As things like chatting with friends and family or reading a newspaper all moved online, those activities suddenly involved sending data in plain text over public infrastructure. Privacy become something that existed only for those that found a way to avoid the default of sending plain text. Privacy became a product of action rather than inaction. 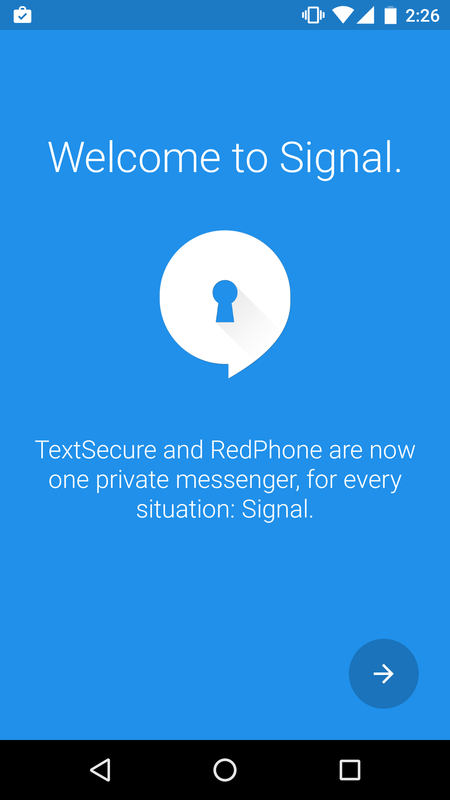 Signal and its predecessor projects Textsecure and Redphone are part of an effort to make privacy the default again by rolling high end encryption into apps polished for mainstream adoption. Signal does two main things: sending text messages and making calls. What Signal actually does for secure communications is very different from what it does for insecure ones and is worth understanding. When sending a text message to someone who does not have Signal, the application sends a standard SMS message. The details of what constitutes an SMS message were hashed out in 1988 long before security was a thing and consequently, a related specification notes “SMS messages are transported without any provisions for privacy or integrity”, but importantly they are transported over the telephone network. 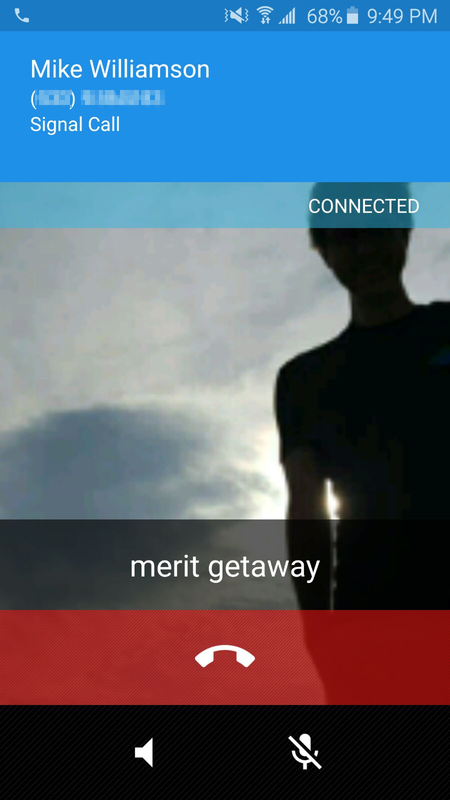 When sending secure text messages, Signal uses your mobile data to send the message using the Textsecure protocol v2. The distinction between those two is worth making since coverage for data vs telephone can vary as can the costs, say if you are travelling and turn off mobile data. The first time you send or receive a secure message with someone, behind the scenes you exchange cryptographic keys. Everything Signal does is focused on ensuring secure communication with the holder of that key. If the key for one of your contacts changes, it should be considered an event worth a quick phone call. This can happen innocently enough, say if they uninstall and then reinstall the app, but since all the other security measures a built on that, its worth asking about. After the first text message has been sent or received, from then on Signal uses those keys to generate new keys for each individual message (Described in detail here.). This ensures that even if one message were to be decrypted, every other message is still safe. Calling follows a similar pattern; for insecure calls Signal simply launches your phones standard phone app, while encrypted calls it handles itself. And like the secure text messages, this also uses your mobile data rather than routing through the phone network. Secure calls are placed using the ZRTP protocol, the details of which are hidden from the user with one important exception. On screen when you make a secure call you will notice two words displayed. These words are part of the ZRTP protocol and were generated based on the key that both parties used to encrypt the call. Both parties should see the same two words. If you say one and ask your contact to read the other, and they don’t match up, they keys you have agreed upon are not the same. If the keys are not the same it suggests someone has tampered with connection information inflight and inserted themselves into your conversation. 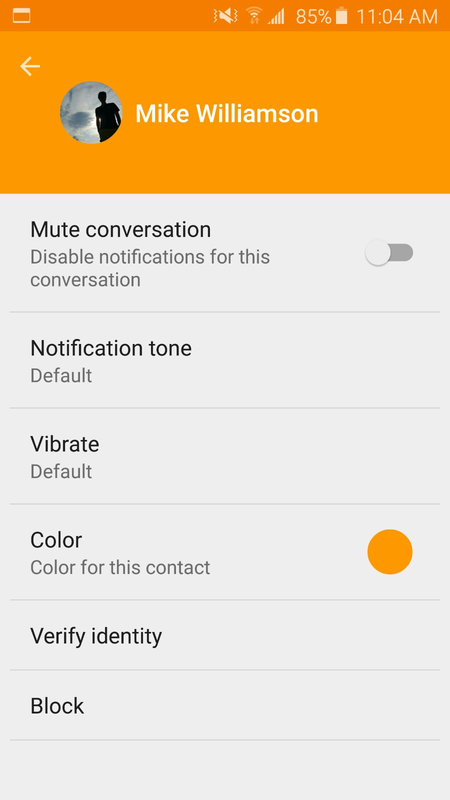 For the interested or the paranoid, Signal lets you verify a contacts key by touching your contacts name/number at the top of your conversation. 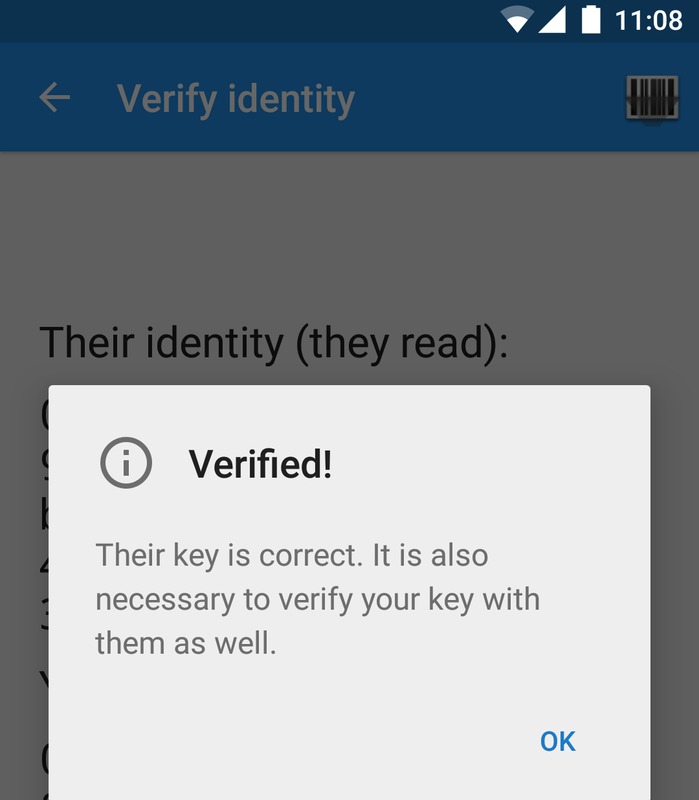 This brings up the details for that contact which includes a “Verify identity” option. 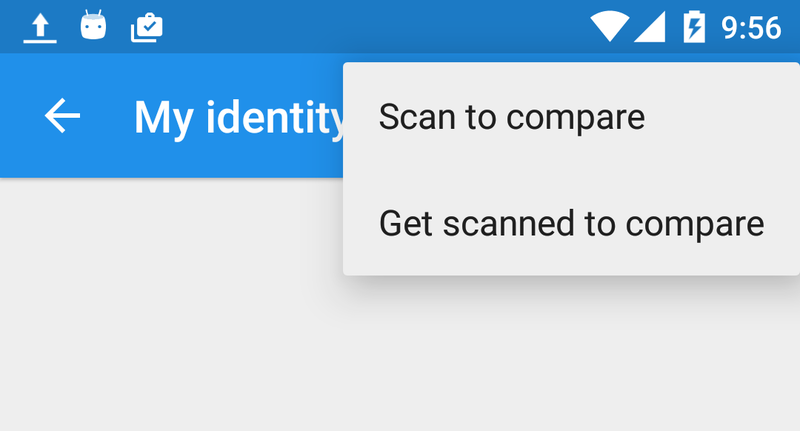 With that, and your own identity details, found under Settings (three vertical dots on the top right of the main screen) > “My Identity Key”, you are able to either read a key fingerprint or if you have a QR/Barcode scanner you can use that to verify your contacts key. Establishing that there is no secret behaviour or hidden flaws somewhere in the code is critical in this world where we put a significant amount of trust in computers (and where the definition of computer is expanding to encompass everything from voting machines to Volkswagens). Signal establishes trust by developing the code in the open the code so that it can be reviewed (like this review of Signal’s predecessor Redphone by Cryptographer Matthew Green). Former Google security researcher Morgan Marquise-Boire has endorsed Signal as has Edward Snowden. But even if you believe the experts that Signal works as advertised, its common for “free” apps to seem significantly less “free” once you realize what they do to turn a profit. With that in mind, another component of trust is understanding the business model behind the products you use. The project is funded by a combination of grants and donations from the Freedom of the Press Foundation and The Shuttlesworth Foundation among others. It is worked on by a core group of contributors led by and supporting cast of volunteers. Signal does a great job of making encrypting your communications a non-event. Encrypted as they travel the network, our messages are now secure against tampering and interception, no matter whose servers/routers they pass through. The result: privacy. The fact that applying security measures result in privacy should tell you that the oft quoted choice between “security vs privacy” is a false one. As pointed out by Timothy Mitchener-Nissen, assuming a balance between these things only results in sacrificing increments of privacy in pursuit of the unachievable idea of total security. The ultimate result is reducing privacy to zero. Signal is just one way to grab back one of those increments of privacy. All of that said my interest in privacy technologies and encryption is an interest for me as a technologist. If you are counting on these technologies like Signal to protect you from anyone serious (like a nation-state) the information above is barely a beginning. I would suggest reading this best practices for Tor and the grugq’s article on signals, intelligence. Actually anything/everything by the grugq.